There is something so mesmerizing about one block wonder quilts. Taking one fabric and making something completely different. Maxine Rosenthal is the author of three amazing books that teach you all you need to know about this fantastic style. When shopping for fabric make sure you take a fussy cut mirror. Place the mirror on several places of the fabric to get a look of the fabrics potential. 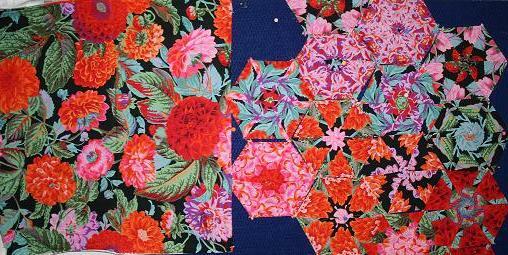 See above the original Kaffe Fassett fabric on the left and my blocks on the right. Below are some blocks from an earlier class. Don't they look fab?!!!! Be warned though, once you have made one of these quilts you will never look at fabric the same again. You may become addicted to making a few of these One Block Wonder quilts and who could blame you really, they are gorgeous!